I want to buy an SSD to run my operating system and my games on. 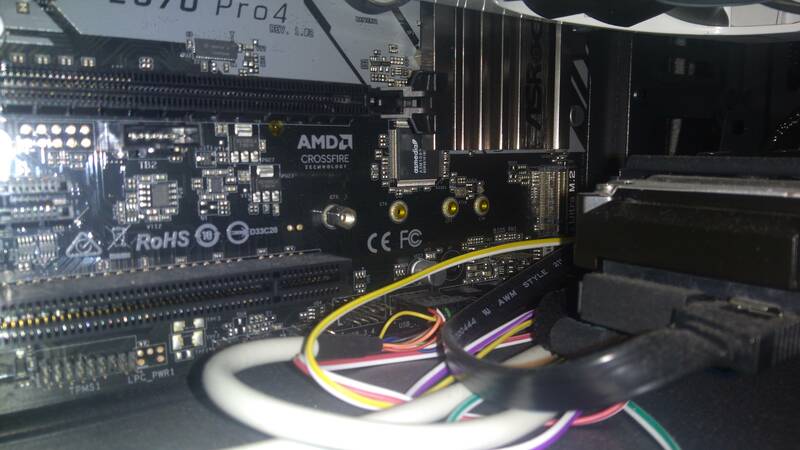 I am completely inept in PC building, I had my current PC build suggested by this forum. I both would like some opinions on what SSD would be worth it the most, and if it would be compatible (my build is below). Should I compromise on storage space to get something more reliable, or can I find something decent with 1 TB storage. Thanks, that is actually the same site I was going to order from. If I get this one, considering the PC I have, will I need to buy additional frames or cables? Or should it fit and have an extra cable slot already in the PC? What case are you using? It looks like a current build, so you probably have some places on it to mount a 2.5 inch drive. You will need a SATA power cable which should have come with your PSU and a standard SATA data cable from the motherboard to the SSD. It takes the same cables as your other hard drives. The Intel is NVMe and therefore the fastest of all of these, but in actual use, you won't see that much difference. Modecom Logic H2 if that is what you mean by 'case'. I got this computer last summer, it is fairly recent. I noticed that the INTEL 1TB M.2 660P is much faster than the rest while still being about the same price. Is there a catch? Also, should I have a slot like that in my PC? 660p is faster than a sata but tends to slow down after transferring a ton of files at once due to its utilization of slc and qlc. Right now I am thinking about the INTEL 1TB M.2 660P. I have only the things in my build as specified, will I have a free slot that is compatible with this? There is no catch. The Intel is a NVMe drive and therefore faster. It uses QLC nand which helps keep the price down versus the others which use TLC nand. There is a M.2 slot on your motherboard which will take either of the last two M.2 drives I suggested. I also read that a screw is needed but not included. What exact type do I need? Sorry, this became unavailable today. How about this one? Is this a good option? Samsung 860 evo is also a good option. 860 and mx500 are very simmilar speed wise. Id pick whatever is cheaper. That is an excellent choice. The WD Blue M.2 is nice too, slightly lower in performance, but less expensive if you want to save a bit. The screw that you need should already be on your motherboard. This is where it is supposed to fit, right? Slightly on the right side, slot that says Ultra m2? With the screw to its left? Again, sorry for my complete cluelessness. Thank you everyone for your help, I ordered the Crucial 1TB MX500 M.2 today. Just a couple idiot spammers trying to spam some worthless site. Hmmmm....the dissonance makes sense, then. Question Which SSD should I buy??? Question Best setup for backup drive with a $100 budget?